This week, TransLink updated the region on the status of the Compass Card smartcard program. The first major piece of news was that TransLink will start rolling out the card to post-secondary students this winter. The roll-out is projected to complete by next summer. The second piece of news is that TransLink may be suspending the requirement to tap-out of buses at system launch time. This means that the system won’t be able to automatically determine how many zones a riders goes through. TransLink is still planning to require people to tap-in/out when on the SkyTrain. The root cause of the delay in fully launching the Compass Card system, and the reason that TransLink may be temporarily suspending the need to tap-out, seems to stem from the slow response time of the smartcard readers installed on their buses. The readers can take up to 3 seconds to read a smartcard. Because of this delay, many of the current Compass Card users aren’t waiting long enough for the system to recognize a tap-out event. This means that some people could be charge for three zones, even if they only travel in one zone. Are the current bus smartcard readers even able to handle the sub-second transition time required for a tap-in/out system to function? It would certainly be bad news if TransLink had to replace all the readers on their buses. The SkyTrain readers are currently able to handle sub-second transition times. Some have called into question the overall value of the Compass Card system. I believe that the Compass Card will be a valuable tool for TransLink and will make using transit easier in the long-term; it has on other transit systems that have deployed smartcard systems. Unfortunately, it seems that every transit system that has deployed a smartcard system has had major start-up pains. As TransLink is now planning to launch the Compass Card system with no tap-out feature, many people are concerned about how the Compass Card could work in our current zone-based fare system. Seattle has the Orca Card for their transit systems. While their light rail system is tap-in/out, on King County Transit buses you simply tell the driver how many zones you are traveling. He pushes a button, then you tap your card. If you register your card online, you can also automatically select how many zone you normally travel. Fare inspectors check the Orca Card to make sure that you’ve paid for the right zones. Our current zone-based fare system could work with a tap-in only Compass Card. Of course, tap-in/out functionality would simplify the use of our transit system. As I am running for Langley City Council, the Langley Times sent a list of questions for me to answer. I’ve shared my answers to their questions in this post. 1- What is the most important issue facing the City, and how would you propose to deal with it? The most important issue facing the City of Langley is revitalizing the community. I will work to revitalize and renew our streets; keeping them in a state of good repair. I will support investing in our sidewalks, ensuring they are safe and meet modern standards. I will work to make cycling safer for people who live in our community. Being heavily involved in promoting better transit for the region, on council I will tirelessly advocate for our community to receive its fair share of transit service. As a long-serving member of the City of Langley’s Parks and Environment Advisory Committee, I will continue to work to make our parks more inviting spaces. In Downtown Langley, I will support improving the quality of the public realm. This means improving lighting, sidewalks, and the street. Simple things like installing more benches will make Downtown more accessible. I will work to change sections of our zoning bylaws which make it expensive to redevelop in Downtown Langley. Our current zoning is limiting the economic potential and walkability of Downtown Langley. I believe in the power of partnerships. I will work with the Downtown Langley Business Association, supporting cost-sharing initiatives that will help grow small business, which in turn will create a vibrant community and support a strong local economy. The City has spent 4 to 10 million dollars annually in recent memory on overpasses and bridges. With these projects complete, I will work to shift this funding to help revitalize our community. 2- What is the best way to deal with the crime issues in the City? Policing is the single largest expense for the City. In 2013, the City collected $21.8 million in property tax and spent $10.1 million on policing. Langley City has the highest ratio of police to residents in Metro Vancouver. Throwing more money at policing is not the solution and will only raise people’s tax bills. Addressing the root cause of crime is key. Social programs are the responsibility of the provincial government. That being said, I believe in partnerships. I will work with the province and local non-profits to ensure that as a community we are addressing these complex issues. Revitalizing our community is a key way to address crime. My plan to revitalize Downtown Langley and the surrounding areas will create safe and inviting spaces during the day and during the evening attracting more people to shop and enjoy Downtown Langley; crime likes to be hidden. More people choosing to shop and explore downtown Langley will improve safety in the area. Growing a strong local economy creates opportunity in the community, as well. Giving people opportunities to succeed is what will help reduce crime. 3- Should the city apply most if not all of its annual take from the casino to upgrading its aging infrastructure, such as water and sewer lines? There are various projects that the City must invest in. Dedicating most of the casino revenue to replacing aging water and sewer infrastructure will mean that little money will be available to improve our parks, streets, and Downtown. Revitalizing Downtown Langley is key; developers pay money to the City whenever a new project is built. The City can do more to leverage current and future money received from developers to support replacing aging water and sewer infrastructure. I will work to make sure that developer dollars go further to keep our underground infrastructure in a state of good repair. 4- Do you support term limits for members of council? Only the province can impose term limits on council; this would require a change to provincial law. As the province just completed a review of local government in BC, I don’t see term limits happening any time soon for councillors in BC. Metro Vancouver occasionally issues “Metro Facts in Focus/Policy Backgrounder” about important topics that impact the livability of our region. At a recent Metro Vancouver Regional Planning and Agricultural Committee meeting, Metro Vancouver released a backgrounder called “Farming in Metro Vancouver.” The background starts on page 189 of the committee meeting agenda. The backgrounder starts with some general information and an overview of farming in the region. Besides forage and pasture land, Metro Vancouver is a large producer of blueberries, cranberries, and potatoes. 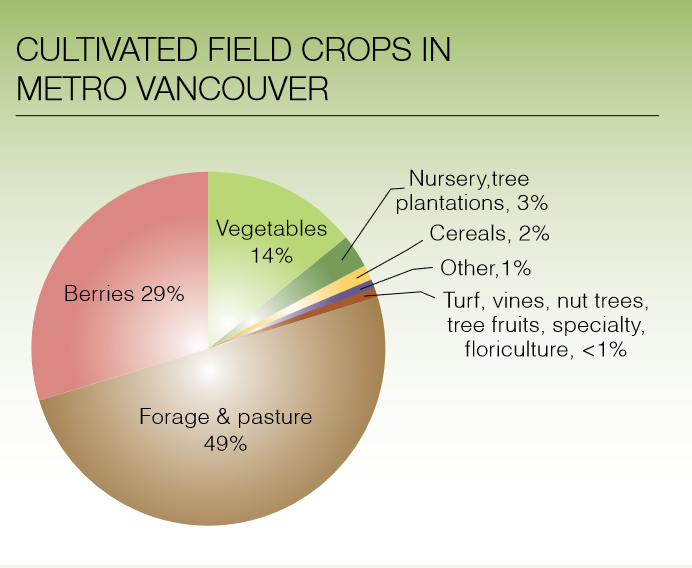 Cultivated Field Crops in Metro Vancouver, 2011. Select image to enlarge. 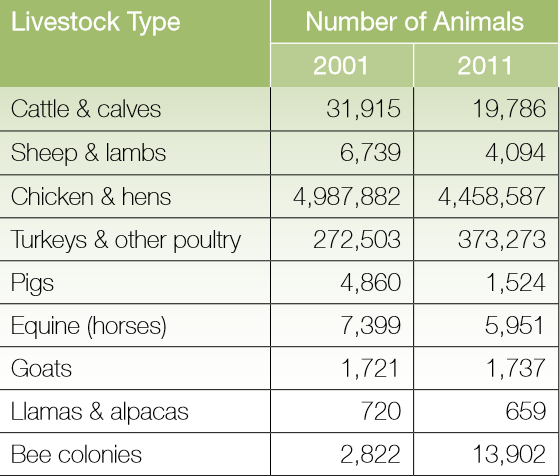 Metro Vancouver is also home to more chickens and turkeys than people! 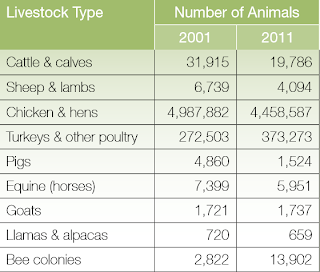 Livestock type and numbers in Metro Vancouver. Select table to enlarge. What I found most interesting was the amount of land in Metro Vancouver, within the Agricultural Land Reserve (ALR), that is actively farmed. Richmond, Pitt Meadows, Maple Ridge, Surrey, Delta, and the Township of Langley all have more than 1,000 hectares of land within the ALR. The Township of Langley contains over 1/3rd of the region’s agricultural land. Looking at the following map, you can see that a good amount of ALR land within Langley is not actively farmed. In Delta, 76% of ALR land is farmed while in Richmond 59% of ALR land is farmed. 56% of ALR land is Surrey is farmed while only 44% of ALR land is the Township of Langley is farmed. 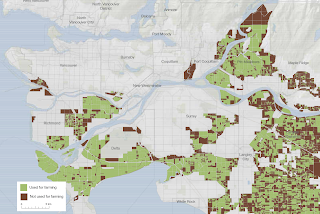 Farming status of parcels within the Metro Vancouver Agricultural Land Reserve. Select map to enlarge. The backgrounder noted that there are five key issues that need to be addressed to protect the long-term viability of farming in Metro Vancouver. The first major issue that needs to be addressed is farmland speculation. Some people purchase farmland in the region under the hope that it will eventually be allowed to be developed with non-farm uses. This drivers up the cost of farmland, limiting access to actual farming. The second major issue is getting farmers access to the capital needed to purchase farm equipment and improve the productivity of land. The third major issues that needs to be address is the marketing of local food. In Metro Vancouver, this means finding better ways to make more local food available in grocery stores. It also means integrating locally produced food into Vancouver’s food culture. Farmland in Metro Vancouver provides ecological services in the region; providing habitat for wildlife, managing flooding, and regulating the climate as a few example. Metro Vancouver, the province, and local governments need to ensure that farmland can still provide these important services to the region. Finally with our climate changing, policies and strategies need to be adopted to allow farming to continue, even as our climate shifts. As I am running for Langley City Council, the Langley Advance sent a list of questions for me to answer. The Advance was looking for yes/no answers to their list of questions, with the option to provide expanded answers to some questions. Looking over the questions, I thought that most of them warranted more than a simple yes/no response. While I will submit my answer to the Langley Advance in the format they requested, I have provided full answer to their questions in this post. Do you currently live in Langley City? How long (in years) have you lived in Langley City? I have lived in the City of Langley for over eight years. Should the Official Community Plan allow increased density in all areas of the City? I believe that the current City of Langley official community plan is good the way it is when it comes to density. There is lots of potential for redevelopment in Downtown Langley and the surrounding area with higher densities as envisioned in the OCP. I see no reason to increase density in other neighbourhoods in the community. Would you support tolling ALL Metro Vancouver bridges to fund transit? Tolling all Metro Vancouver bridges is something that only the province can do. While I personally support fair tolling across the region, there is very little I could do as a City Councillor to make that happen. I think that the current tolling policy is unfair and creates traffic issues by having only some crossings tolled. Would you support removing tolls from all Metro Vancouver bridges? The tolling of bridges is the responsibility of the province and TransLink. TransLink is directed by the Mayors’ Council. A Langley City Councillor would have no say in this matter. Tolling is an important way to fund bridges; these are multi-billion dollar projects. When it comes to major transportation systems (whether bridges or transit), the cost should be split between taxes and direct-user fees. People who use these costly systems should pay their fair share. User fees also help people make smart transportation choices, reducing congestion, and ultimately saving them money. Would you support road pricing to fund transit? No. I believe road pricing should be used to fund roads. Road pricing lets people know how much they are paying for how much they drive. This will reduce congestion and save people money. I would support reducing gas tax if road pricing was introduced, but road pricing is under the control of the province. There is very little a Langley City Councillor could accomplish. Would you support increasing property taxes to fund transit? No. You can read Leap Ahead: A transit plan for Metro Vancouver which I co-authored. How to better fund transit is detailed in that report. Should a tree protection bylaw be brought in? A proposed tree protection bylaw was introduce by the City of Langley in 2010. It was flawed. More trees got cut down because of that proposed bylaw than at any other time I can remember. That bylaw didn’t pass. It seemed like it was a solution looking for a problem. Before supporting a new tree protection bylaw, I would want to see that there is a clear problem that needs to be resolved, and that it has the broad support of the community. Should developers be required to provide more low-income housing in the City? Providing low-incoming housing is really a responsibility of the province. Langley City is one of the most affordable communities in Metro Vancouver. That being said, I’d work hard to partner with community organizations and the province to make sure that more affordable housing is provided for people that need it, including seniors. I would also work to ensure that major new developments include housing options at a number of different price points. Should the City create more bike lanes and public cycling infrastructure? I believe the City should invest in creating greenways and protected cycling lanes. Cycling lanes and greenways are cost effective. They provide the safety needed to help people feel comfortable cycling in the community giving people transportation choice. Should more of the City’s casino revenue be used to directly reduce property tax rates? The City uses casino revenue to pay for capital projects. If the casino revenue was used to lower property taxes, the City infrastructure would start to crumble. Deferring maintenance to future years would cause a deterioration of the quality of life in our community. It would also stop Downtown Revitalization. Finally, it would pass the cost of replacing and improving infrastructure to future generations at a much higher cost. It would be a lose, lose, lose. Was building the $14 million Timms Recreation Centre the right decision? Yes, the City needs to continue investing in our Downtown, providing high quality facilities that will improve the quality of life for people that call Langley home. This investment will also provide a catalyst for revitalizing Downtown Langley which will create a strong local economy. Does the City need more public green space? The City has a good amount of green space today. I support enhancing our current parks, trails, Brydon Lagoon, and the Nicomekl floodplain, creating safe and enjoyable public spaces. I want to make our park system a point of a pride for our community. Does the City need more sports and recreation facilities? I support the City of Langley working with the sports community to ensure that our amenities are meeting the needs of its users. Does the City do enough to support business? I believe the City of Langley could do more to support business in Downtown Langley. I would work to create a stronger working relationship and create new partnerships with the Downtown Langley BIA. Does the City do enough for its seniors population? No. I believe that the City needs to partner with community organization to ensure the City it doing enough to support our seniors. Does the City do enough for youth? No. The City of Langley needs to work with the school board and other community organizations to make sure that this City is delivering the right programs that support young people. Does the City provide adequate cultural services? I believe that we are missing an Arts & Cultural Centre. I would support such a centre in Downtown Langley. It would help revitalize Downtown Langley which would, in turn, help reduce crime. Does the City provide sufficient fire/rescue service? Are you satisfied that the City receives its fair share through the Township/City policing service agreement? The City of Langley has about 1 police officer for every 500 citizens. This is the highest ratio in Metro Vancouver. The City is receiving its fair share. Does the City have a good working relationship with the Township? Yes, but I believe the City and Township could work closer together on Parks and Recreation. Where I grew up, both Vernon and Coldstream —two communities of vastly different sizes— partnered to deliver parks and recreation serves. It served both communities well and saved money; I believe it would also serve Langley well. Do you believe Langley Township and City should be amalgamated into one municipality? No. I’ve done some research on this. Financially, amalgamation drives up property tax for all taxpayers. Larger municipalities are more bureaucratic. Larger municipalities also makes it harder to have a voice as a citizen. I can call the Mayor of Langley up any day and get a meeting within a week. Could the same be said if I was living in the City of Vancouver? Over the next several weekends, my campaign is doing a major distribution of Elect Nathan postcards and will be canvasing selected neighbourhoods in the City of Langley. This will help let people know about my vision for Langley, and the reasons why I’m running for council. We have a core group of people that are committed to helping out rain or shine, but I could use your help on Saturday, October 25th and November 1st. We will meet back at Frosting Cupcakery after for a little treat to wrap up the day. If you would like to volunteer, just show up at 10:30am and look for myself. If you would like more information, please email me at nathan@nathanpachal.com or call 778-288-8720. Last Thursday, I participated in the Greater Langley Chamber of Commerce’s All-Candidates Debate for the City of Langley. Both the Langley Times and Langley Advance provided coverage of the debate. 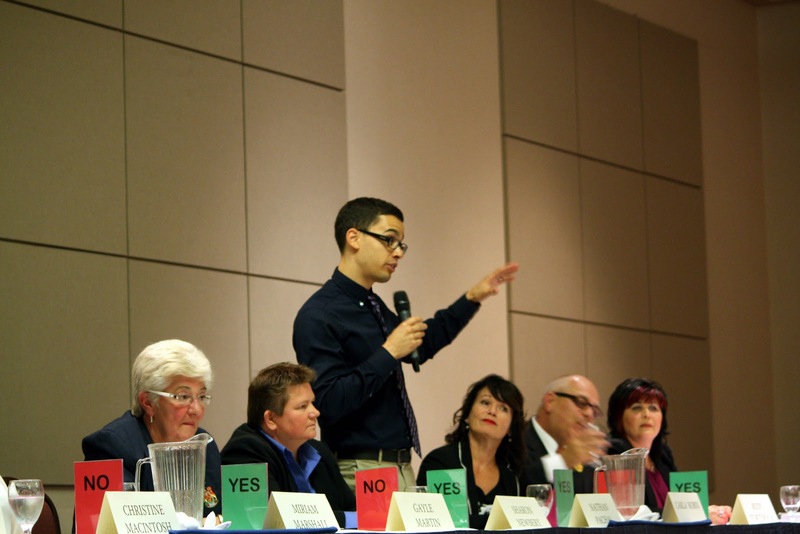 Myself, Nathan Pachal, talking about building streets that work, a community that's strong at last Thursday's City of Langley All-Candidates Debate. Supporting the creation of a strong local economy by renewing and investing in Downtown Langley, creating a vibrant and prosperous core. Working hard to build an accessible and safe community for all people. Starting with simple things like making sure our sidewalks are safe and connected, and supporting innovative ways to make our community feel safer by working with the RCMP and incorporating crime prevention through environmental design principles as relates to public spaces. Promoting and enhancing our park system. We have a diamond in the rough —the Nickomekl Floodplain— and I will work to make it shine. I will also work hard to ensure that the City of Langley takes action to restore Brydon Lagoon as a great place for residents, visitors, and most importantly, wildlife. When I was reading the Langley Advance, I noticed in the print edition I was quoted as saying “I guess tax is a pretty crappy way to raise money.” What I actually said was “A gas tax is a pretty crappy way to raise money.” The online Langley Advance article has been corrected. This quote was in reference to how we pay for regionally significant roads and bridges in Metro Vancouver. In the short term, I would support a shift away from larger tolls on the Port Mann and Golden Ears Bridge, to smaller tolls on all major crossings. Not only will this help pay for the upkeep of bridges, but it will also help people make better choices on how to travel, reducing congestion. In the long term, I would support the gradual elimination of gas tax, replacing it with direct road pricing. Gas tax is a poor way to fund roads because as vehicles become more efficient, less revenue is generated to pay for the maintenance of regionally significant roads. Gas tax isn’t directly tied to road usage, so it doesn’t help reduce congestion. Road pricing is fairer as people pay-as-they-go. Road pricing also helps reduce congestion. You can read a post I wrote in February for more information on road pricing. Also check out the report “Congested and Nowhere to Go: Congestion, Road Infrastructure, and Road Pricing in Metro Vancouver” by Jonathan Arnold. Of course major roads and bridges are controlled by the provincial government and TransLink. On council, I would only be able to advocate for change. Back in April 2012, the City of Langley’s then Mayor Peter Fassbender and developer David Phan announced Charleston Place. 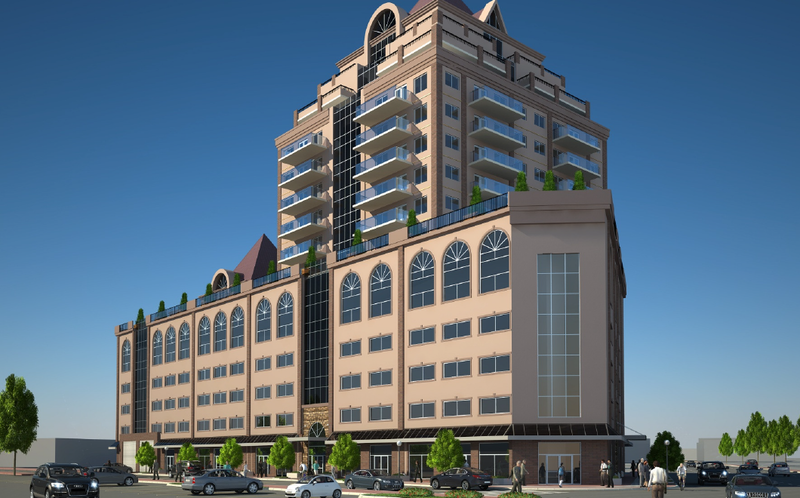 Located at the corner of Industrial Avenue and 203rd Street, Charleston Place was to be a 15 storey, mixed-use building. It would have ground-level retail units, several upper floors of office space, and high-end condos. If this project actually came to fruition, it would have been a game-changer for development in Downtown Langley. Charleston Place 1.0. Select image to enlarge. Since this building would have been expense to construct, and since Langley City is one of the most affordable places for real estate in Metro Vancouver, I asked several developers if they thought the project would get off the ground. Charleston Place was completely different than any other project recently proposed in the City. Two developers told me no; I posted about this in April 2013. It turns out those developers were right. Last night, City of Langley Council heard a new proposal which I’ll call Charleston Place 2.0. It is a five-storey apartment building. Proposed 5 storey, 78 unit condo building. View from 203rd Street. Select image to enlarge. I have no issue with low-rise buildings. Four to six-storey buildings provide the right density to support walkable, transit-friendly cores and corridors. These size buildings are probably the right scale for Downtown Langley. I am disappointed that there is no ground-level retail in this proposed project. Proposed 5 storey, 78 unit condo. View from Industrial Avenue. Select image to enlarge. While I would normally be in full support of a single-use apartment building project one block away from Fraser Highway, this project's location will be kitty-corner to a future transit exchange. Creating a vibrant, safe, and pedestrian-friendly area will be key to the success of the transit exchange. This apartment project will create a pedestrian dead zone. You can read more about the future transit exchange on a previous blog post. Since I’ve lived in Downtown Langley, I’ve seen one drive-thru built, one drive-thru being building, and several single-use apartment buildings constructed in Downtown Langley. In recent memory, the Muse (at 20238 Fraser Highway) is one of the only mixed-use buildings that I've seen constructed in Downtown Langley. Buildings with ground-level units for retail stores, cafes, and restaurants —fronting the street and treating pedestrians as first-class citizens— are the key to the success of Downtown Langley as a walkable core. Lately new development projects in Downtown Langley seem to be reducing the opportunity to create vibrant, pedestrians-friendly areas. Recently, I had the chance to read City Building, Nine Planning Principles for the Twenty-First Century. The book is written by John Lund Kriken who, among other things, was the founder of Skidmore, Owings & Merrill’s San Francisco-based Urban Design & Planning Studio. Kriken starts his book by stating that our world is becoming increasingly urbanized. As more people choose to live in cities, he says that we need to rethink how we design cities to improve the quality of life of their residents. Kriken argues that how design cities —land-use, transportation, public space, and buidlings— most of the time do not end up building healthy nor happy places for people. He developed the nine principles to help guide place-making that enhances people's quality of life while protecting our natural environment. With this in mind, Kriken gives a brief history of how we got to where we are today. He also explains why a comprehensive framework is needed to guide place-making from the regional scale all the way down to the neighbourhood and building scale. Kriken’s nine principles are sustainability, accessibility, diversity, open space, compatibility, incentives, adaptability, density, and identity. Under each of the principles, Kriken explains what the principles means for place-making, then gives several case studies. Most of the case studies are from SOM projects. While each of Kriken’s principles are well thought out and should be considered, I wanted to share a few items that stood out for me. Out of the gate, Kriken starts by talking about how urban settlement needs to be balanced with conversation to preserve farmland, protect air and water quality, and ensure that urban settlement isn’t built in dangerous areas like floodplains. He notes that rules are needed to protect cities from themselves; he advocated for higher-order government plans. It seems that our region has already implemented much of what Kriken is advocating for in this regard through Metro Vancouver. Kriken talks about how to building and support multi-modal streets and neighbourhoods. He also talks about finding the right mixed of building types and densities. Interestingly enough, much of what Kriken talks about reminded me of a whitepaper from TransLink about the 6 “Ds” for creating transit-oriented communities. One of the things that I’ve heard people talk about is that the ground-level design of a building —how it interacts with the public realm— is one of the key elements of good design. For example, a building that fronts a sidewalk with retail stores will create a different dynamic then a building that front a sidewalk with a blank wall. Kriken notes that projects need to be looked at in the context of a whole neighbourhood or community. He cautions about looking at projects in a one-off fashion; this leads to issues. 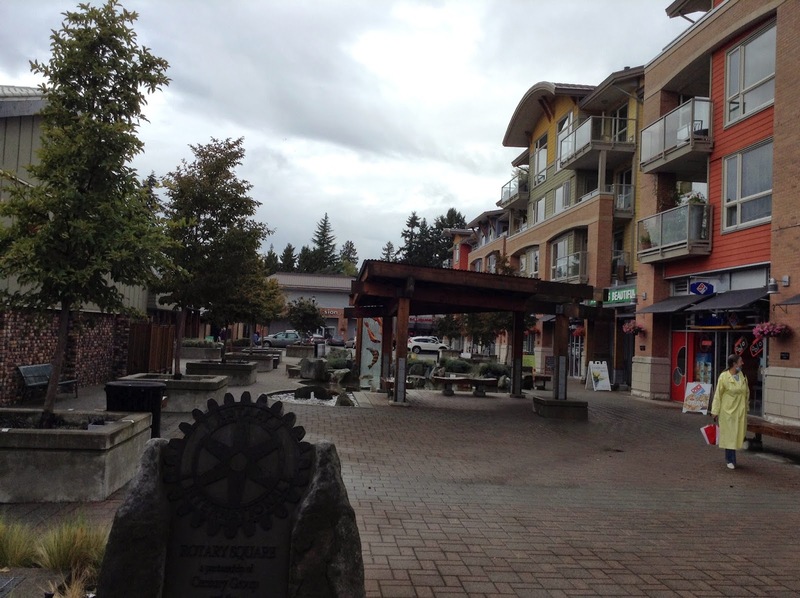 In the City of Langley, my community is trying to redevelopment and revitalize its downtown core. Kriken has a whole chapter on how to support brownfield redevelopment. He also gives a cautionary tale of San Jose, in the San Francisco Bay Area, which is still struggling to revitalize its downtown core. At the end of the book, Kriken gives a call to arms on building better cities and regions. Kriken believes that cities are the solution, not the problem, to creating a high quality of life for people while preserving our natural systems. Kriken book is full of great visuals to support his nine planning principles. This book is accessible, and I would recommend that anyone who has an interest in urbanism give it a read. I believe this book should be required reading for anyone who has decision-making ability that impacts the built-form of our communities. Tonight, I’ll be participating in the Greater Langley Chamber of Commerce’s Municipal All Candidates Meeting for the City of Langley. The event is free and open to all members of the public. It starts at 7:00pm at the Cascades Casino. More information is on the Chamber’s website. It would be great if you could make it. City and Township of Langley Mayoral Candidates. 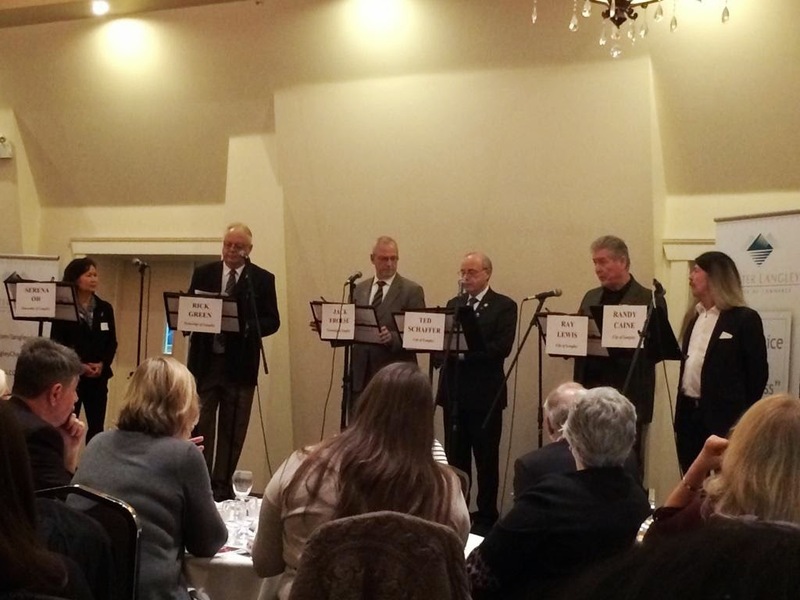 Last night, I attended the Greater Langley Chamber of Commerce’s Mayoral Debate. The event featured mayoral candidate for both the City and Township of Langley. Running for mayor in the City of Langley are Randy Caine, Ray Lewis, and Ted Schaffer. Running in the Township are Jack Froese, Rick Green, and Serena Oh. Unfortunately Serena Oh was completely ill informed of the issues. The answers she gave to most of the questions seemed to come from left-field. It really took away from the cadence of the event. Ray Lewis was concerned about crime in the City of Langley though he didn’t seem to have any practical examples of how he would actually address the issue. He was not up to speed on other issues facing the community. The questions that the Chamber moderators asked revolved around development, transit, the Township leaving Metro Vancouver, crime in the City, and amalgamation. The Chamber also asked the mayoral candidates to talk about local government worker’s salaries increasing faster than provincial government worker’s salaries, referencing the highly-flawed report “BC Public Sector Compensation Review.” Most of the candidates noted that due to federal and provincial downloading, local government has had to pick up the slack to deliver much needed services that other levels of government no longer support. They also mentioned that you need to pay people a fair wage to attach high-quality employees. On amalgamation, I overheard many in the audience say that bring up that topic was like flogging a dead horse. Both Froese and Green were in support of amalgamation. Schaffer was opposed to amalgamation while Caine was in support of amalgamation. Regarding crime in the City of Langley, Schaffer talked about how the City has the highest ratio of RCMP to residences in Canada; 1 for every 500. Caine said that if we want to address crime, we need to address the root causes: poverty and addiction. Some people have called on the Township to leave Metro Vancouver due to the lawsuit between Metro and the Township over the Trinity Western University District. Both Froese and Green said that leaving Metro Vancouver would be an expensive and messy process; a road that would have to be gone down with extreme caution. Green was opposed to leaving Metro Vancouver, Froese would only considering leaving Metro Vancouver after commissioning extensive research on the issue which may lead to a referendum on the issue. Of course TransLink came up last night. Froese and Schaffer talked about how South of Fraser mayors fought hard to get South of Fraser transit needs incorporated into our region’s vision for transit. I was happy that Froese noted that TransLink funds both the Golden Ears Bridge and the Major Road Network. Froese and Schaffer both acknowledge that getting better transit will require more money. Both were opposed to the transit referendum being imposed on the region by the province. I have to give Schaffer credit for saying that a small regional sale tax would be the most practical way to fund needed transit improvement. Froese noted that because groups like the Canadian Taxpayers Federation and the province have called on TransLink to be more efficient, TransLink has reduced service on some routes in the name of efficiency, leading to even worse transit service in some areas. Green said that he would not support giving TransLink any extra money until there was more transit service in Langley. Of course without new funding, TransLink can’t afford to provide new service. While this may get Green some political brownie points, it won’t actually get better transit in the Township. On development in the City, Schaffer noted that the City is indeed redeveloping, noted several multifamily projects under construction. Caine talked about the need to replace aging infrastructure in the City, and the need to redevelop Langley in a sustainable manner. In the Township, Froese noted that his community has been growing at a steady 2% throughout its history. He said that the Township will have to accommodate more people and that “turning off” development is simply not an option. There was a question about if the Township would stop development until the School District built more schools. Froese said that the School District won’t build new schools until there was new development. Green said that he won’t “turn off” development, but that he would review every single development plan in the Township. It seemed like he was trying to get more political brownie point as this review would be a costly, decades-long process, and likely wouldn’t accomplish much. It was interesting to attend the mayors debate thought I didn’t hear anything out of step with what the mayoral candidates have already being talking about publicly. Every quarter, the American Public Transportation Association (APTA) releases transit ridership statistics for participating agencies in Canada and the US. TransLink provides its ridership data to the APTA. The APTA recently released its second quarter ridership report; TransLink ridership is down 1.51% compared to 2013. Table source: APTA Transit Ridership Report, Second Quarter, 2014. Ridership data in thousands. As I mentioned in a post this summer, TransLink ridership was going up until 2013. Ridership started to decline in 2013, not surprisingly as TransLink started to aggressively optimize the transit network. With no new funding to expand transit service to address overcrowding in some parts of the region or correct the underinvestment in other parts, TransLink has been shifting service hours around. For example, if TransLink wants to increase the frequent of the 99 B-Line, frequent would need to be reduced on a route somewhere else in the region. About 50% of all bus trips take place in Vancouver and UBC. According to TransLink data, bus ridership actually grew in most part of the region in 2013. Vancouver/UBC and the Northeast Sector were the major exceptions. So while more people are taking the bus in Surrey, less are in Vancouver. Looking at the preceding table, the Trolley Bus Network saw the largest drop in ridership. As the Trolley Bus Network really only serves Vancouver/UBC, it support previous data that transit ridership is mostly declining in the City of Vancouver. I believe that are several reason for this decline. One of the reason is likely due to overcrowding on the bus network; people are simplely deciding to not take the bus. With the City of Vancouver investing heavily in quality cycling infrastructure, I wouldn’t be surprised if people are shifting to cycling. It would be interesting to see the mode split between driving, transit, and active transportation from 2010 forward in the City of Vancouver. Of course the other major reduction in ridership is on the HandyDart network which saw massive services cuts in the last few years. Transit ridership is going in the wrong direction in Metro Vancouver. With the upcoming transit referendum, combined with TransLink’s bad brand, I’m concerned that our region many not have the funding to deliver much need transit service. One of the reasons why I’m running for City of Langley Council is to build an accessible and safe community. This starts with the simple things like making our sidewalks safe, meeting modern standards. I had the chance to walk around Downtown Langley with Leah Bolton from Joytv News recently. I pointed out some of the current accessibility issues with our sidewalks, and what could be done to improve them. I also chatted with Acting Mayor Ted Schaffer and community members to get their take on the state of sidewalks in the community. There is room for improvement. A few weeks ago, I had the chance to go on a walking tour of Tsawwassen with a friend who lives there. I must admit that I haven’t spent too much time exploring South Delta; this was a great opportunity to see the area. Tsawwassen has a population of around 20,000. One of the first things that I experienced was the transit network in South Delta; it isn’t setup to move people between South Delta and the rest of the South of Fraser. While transit service to the Canada Line is fast and frequent, it took me a little over 2.5 hours to get from my place in Downtown Langley to Tsawwassen. I’m sure that TransLink is well aware, but there really is a lack of frequent, direct transit service to connect communities like Tsawwassen, Ladner, White Rock, South Surrey, and Langley together. This likely won’t change until TransLink is given new revenue sources. One of the first things that I noticed upon entering Tsawwassen was the huge mega-mall that is under construction on Tsawwassen First Nations (TFN) land. You can read more about this on a previous blog post. The majority of the built-form along 56th Street is auto-oriented in Tsawwassen. Tsawwassen doesn’t have a town centre. Businesses and higher-density housing is located along 56th Street, the main north/south transportation corridor in the community. While the majority of development along that corridor is auto-oriented, Delta has been working to make the corridor more walkable. In fact, most of the new buildings along 56th Street are mixed-use with ground-level retail that front the street. If done right, 56th Street could become a transit corridor with fast, frequent service. 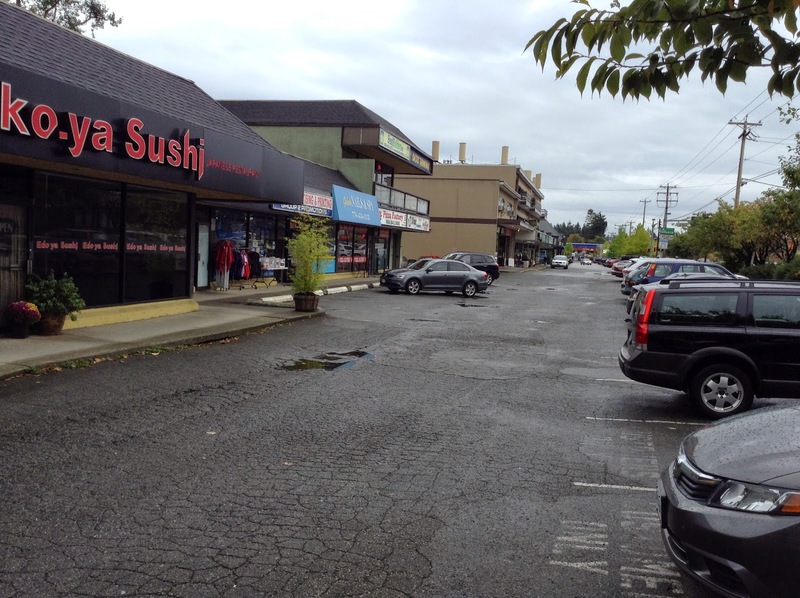 If Tsawwassen had a town centre, it would be at 56th Street and 12th Avenue. This intersection is flanked by strip malls. One of the things I noticed is that these strip malls have been adapted to be more walkable. Shops now front, and can be accessed via, the street. Also interested to note is that the strip malls have become more pedestrians-friendly with “high street” like corridors that are accessible from the street. Retrofitting strip malls to be more pedestrians friendly. Pedestrian corridor through strip mall in Tsawwassen. 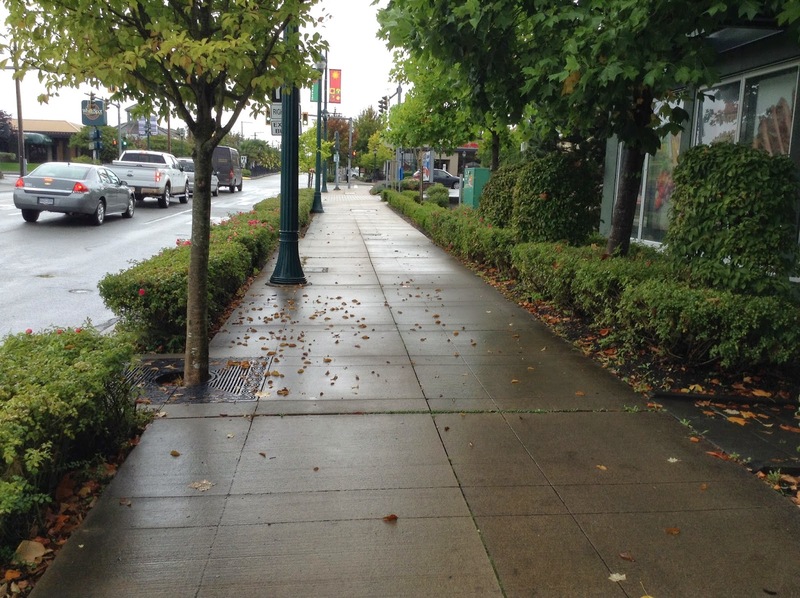 Speaking about walkability, while many of the sidewalks in Tsawwassen are too small or in a state of poor repair, Delta has adopted a much better sidewalk standard that it is currently being building out. The newer sidewalks are clear of obstructions with enough room for two people in wheelchairs to pass with ease. New sidewalk standard in Tsawwassen. There were other parts of Tsawwaseen that we walked to, including Metro Vancouver’s Boundary Bay Regional Park, a jewel in our region’s park system. If Delta continues to promote the creation of a walkable 56th Street, Tsawwassen could become one of the most walkable and transit-friendly communities in the region. It will be interesting to see how the new construction on TFN land interacts with Tsawwassen. This morning, the BC Ministry of Transportation launched “B.C. on the Move: A 10-year Transportation Plan”. The province is seeking public feedback about the plan between October 14th and December 12th to help identify priorities for people in the province. The government has set up a website where you can download a discussion guide and also provide feedback via a survey. Looking at the information in the discussion guide, I wonder how much room there will be to change or provide meaningful feedback on transportation priorities in the province. The government has outlined four main priorities: moving goods and people safely and reliably; growing the economy; connecting and strengthening communities; and, maximizing collaboration and investment with partners, including First Nations, the federal government, regional and local governments, and the private sector. The discussion guide is divided into three sections. One section outlines the state of the transportation system in BC. It talks about roads, transit, cycling, rail, ferries, ports, and airports; it’s actually very multi-modal and gives equal attention to all modes of travel. The second section highlights what transportation infrastructure the government has invested in since the start of the 21st century. Looking at this section, it becomes apparent that the province has focused more on expanding roads and building bridges than over forms of transportation. The province has also invested heavily in road infrastructure to improve access for natural resource extraction. The section does highlight the completion of the Canada Line, Kelowna Rapid Bus, and the start of Evergreen line construction. The final section focuses on future priorities of the provincial government. Sadly, this is the least multi-modal section of the guide. While the province has four goals for the future of transportation, it is clear by looking at the discussion guide, that there are really only two main goals for the province: moving people and goods safely and reliably, and growing the economy. These goals have specific actions, while the remaining goals seem more aspirational. It is also apparent from the discussion guide that reducing GHG emissions is not a priority for the province. Sadly, transit, cycling, and reducing GHG emissions appear to be afterthoughts; the government wants bigger roads and better airports. For Metro Vancouver, the province is going to replace the George Massey Tunnel and that’s about it. The province has basically washed its hands of transit in the region. The rest of the province will see more roads, especially if those roads will help open up LNG opportunities. While the province is seeking public feedback about its plan, I feel like the province’s investment strategy is already a foregone conclusion: more roads, and especially more roads to support LNG. A few weeks ago, local government officials throughout the province attended the annual Union of British Columbia Municipalities convention. In preparation for the convention, the UBCM commissions and releases a policy paper on an important topic that impacts local governments in the province. This year, the UBCM released a policy paper on BC Ferries. The report received a fair bit of media attention as it found a strong link between increased fares and reduced ridership. It also found that increased fares were having a negative impact on the GDP of coast communities; there was $2.3 billion in lost GDP between 2003 and 2013. The report noted that “for every $1 of tax revenue invested in BC Ferries, $8.40 of economic activity was generated”. That wealth was spread throughout the province. Of course, the provincial government promptly rejected the report's findings. If you want to read more, you can download the full report. BC Ferries is a form of public transit, it is accounted as such within the budget of the Ministry of Transportation. One of the interesting tables in the UBCM policy paper is on fare box recovery. This is the ratio between taxpayer investment in a service, and the service’s direct user fees. Farebox Recovery Rates of Global Ferry Operators and Other Transit Providers. Source: Boatswains to The Bollards: A Socioeconomic Impact Analysis of BB Ferries. It is interesting to note that BC Ferries is 92% directly funded by its users, compared to 66% for Washington State Ferries. It is also interesting to note that TransLink is 51% directly funded by its users. Much like BC Ferries, direct user funding has been steadily climbing; TransLink was 44.7% funded directly by its users is in 2009. At the same time BC Transit —which provides transit service to the rest of the province— was 33% directly funded by its users. The South Coast is the only place where there is a direct user fee for roads; you have to pay a toll to use the Port Mann Bridge and the Golden Ears Bridge. User’s fees aren't bad, but I find it interesting that people in the South Coast pay more direct users fee to use the transportation system than people in the rest of the province. It seems that we have a two-tiered transportation system in BC. If you live in the South Coast, the provincial government expects you to pay more out-of-pocket to use transportation while the rest of the province get a larger subsidy to use the transportation network. $4,000 raised, $1,000 left. 5 days to go! With my nomination papers filed, my campaign for election to Langley City Council is in full swing. A few weeks ago with the help of my street team, we gave out 150 cupcakes in Downtown Langley. This was a great opportunity to speak with people in the community. What I heard was that people want safe and accessible streets. People love Downtown Langley and want to see it thrive. People want to see more investment in our parks system. This is what I want for Langley as well. If elected, I will be able to bring a fresh perspective to City Council and a renewed vision for our community. Last month, we launched our fundraising campaign with the goal of raising $5,000. Thanks to the generosity of over 25 people, we’ve raised about $4,000 via cheque, Paypal, and Fundrazr. We still have $1,000 left to raise in 5 days. It is critical that we raise this last $1,000, which will allow us to purchase signs, pamphlets, and mailers to help spread the word about my vision for Langley. If you’ve already donated, thank you so much. If you are thinking about donating, please do so soon. 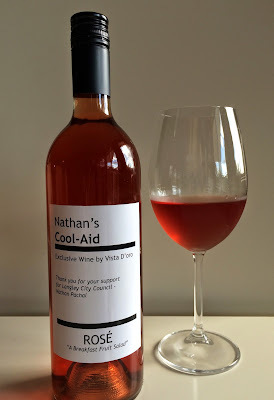 As an added bonus, if you donate $100 or more via Paypal in the next 5 days, you will get an exclusive bottle of “Nathan’s Cool-Aid,” an exclusive rosé by local Langley vineyard Vista d’Oro. Together we can build streets that work, and community that’s strong. Yesterday, I was on BC 1 talking about the delays around the full launch of the Compass Card as this was the one year anniversary of the beta testing program. I finished the interview at around 4:45pm in Downtown Vancouver. Luckily, I just missed the major disruption to SkyTrain service yesterday evening, but the general timing was rather unfortunate. Though not as bad as the two system-wide shutdowns this summer, service was interrupted for about 4 hours on the Expo Line. As it turns out, it was a faulty modem that caused this latest interruption. Between a failed computer card, someone “knocking out” the power, and a failed modem, I have to wonder how redundant the system is. The SkyTrain system is extremely safe; when the system detects a fault, it shuts down. SkyTrain is a critical piece of our transportation system, so equally important is quick recovery from these faults. While many have pointed out that the system is indeed aging, the equipment that has failed isn’t original to the system. It appears that TransLink is maintaining the system, but I wonder how redundant the actual design of the system is. Would it make sense for TransLink to have two modems at each switch for problems like yesterday? Should TransLink have redundant computer cards to make sure that if one card fails, another will take its place in an instant? What systems could be put in place to reduce the risk of someone “knocking out” the power to SkyTrain control? I work in broadcast television where 30 seconds of disruption is a big deal. When equipment fails, fast recovery is important. If one piece of equipment fails, another will pick up the slack. Sometime we even deliver the same content in parallel for redundancy. This redundancy costs money, usually about double the cost of a non-redundant system. While most television systems are redundant, we to have to weigh the cost of redundant systems versus the cost of failure. Sometimes having a redundant system doesn’t make financial sense. Many people commented last night that the ~$200 million Compass Card program took away money from TransLink to make the SkyTrain system more redundant. The thing to remember about the Compass Card program is that it was a provincial project forced upon TransLink by former transportation minster Kevin Falcon. This money would not have been available for adding more redundancy to the SkyTrain system. Ironically, it is the provincial government that has also forced TransLink to reduce costs. The first thing to go when reducing costs are redundancies. TransLink has commissioned a report about the system failure around SkyTrain; the report is due out later this month. I look forward to reading it. Besides this report, it would be extremely useful to see a report on TransLink’s critical systems, what redundancies are currently in place, and what one-time and ongoing costs would be to increase system redundancies. Of course adding redundancy to the system will require additional revenue. TransLink currently doesn’t have, nor is likely to get, additional revenue due to the impasse between the province and our region in funding transit.